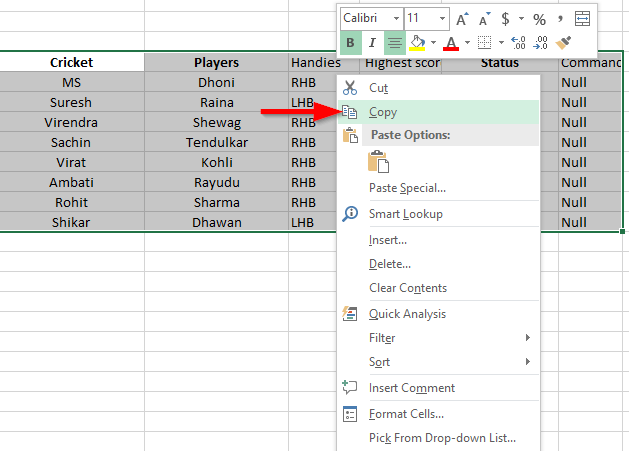 » How to add an Excel table into a Word 2016 or 2019 document? How to add an Excel table into a Word 2016 or 2019 document? Applicability: Excel 2019, 2016 and earlier versions; Windows 7, 10 and macOS. Working on a quarterly operational report for management. I have a nice spreadsheet with some sales information that i would like to insert into a Word document that i am authoring. Any ideas? Thanks for the question, Dana. See below for the details. I assumed you are using Windows, but just in case, added some pointers for MAC users below. Note: This option will allow you to embed a screenshot of your spreadsheet, which you won’t be able to modify. For a “live” spreadsheet option, scroll down. Select the area you would like to add into Word, right click and hit Copy or press CTRL+C. Now open your Word document where the embed has to be done and right click and hit paste or press CTRL+V. Open your Word document, where your Excel spreadsheet has to be placed. Click on the Insert in the ribbon and select Object in the Text section. Select the Create from file and browse to your excel document which has to be inserted. Navigate to the place in your document that you want to place the link to your workbook. Using the Browse button , navigate and point to the file stored in your computer that you would like to attach. Then hit the Link to File and Display as Icon checkboxes, to embed a link to your file into your doc. Double click on the inserted document. Make necessary adjustments to make the table fit into your Word page. If needed we can edit further inside the embedded excel sheet. We can also embed some other applications and edit them in word. Read further for the procedure. 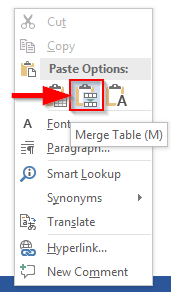 Open your word document and select the object in the insert ribbon. In the create new option click on your desired application to make the application embed to word document. For instance, if we need to embed a powerpoint presentation in word 2016. Hit the PowerPoint presentation side in the object type and select OK.
Now we can edit with the new presentation slide embedded in Word 2016. 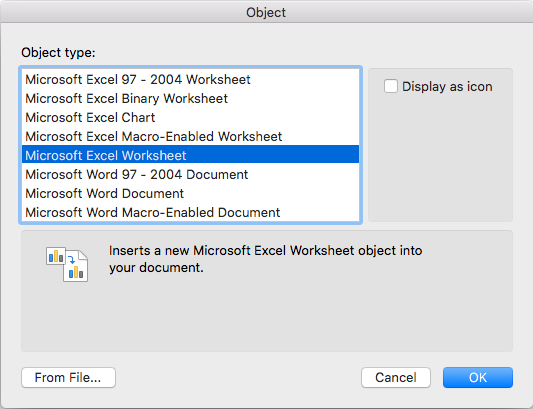 If you are using Word for MAC OS X, you can insert existing spreadsheets into your documents as well. Procedure is similar to the one we outlined before for Windows. Open Microsoft Word and navigate to your document. Pick the location into which you would like to add your spreadsheet content. Hit Insert, and select Object. Hit From file… and select the Excel workbook that has the content you would like to embed. Now go ahead and adjust the placement, height and weight of your embedded worksheet. Once done, save your spreadsheet (File>>Save or Command + S). Note that on Word for MAC OSX you are not able to embed “live” Presentations ; however you can embed other documents into your Word files. Got additional related questions? Look into our guide on how to get your questions answered.